Marco qualified in Physiotherapy in 2009 from the University of Coruna, Spain. He has been working between Spain and England in both the NHS and private sectors within different areas of physiotherapy, including musculoskeletal, orthopaedics, neurology and within the local community. 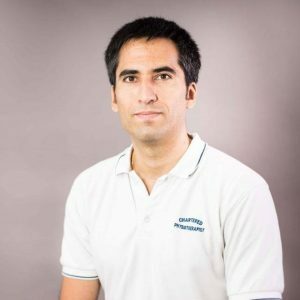 Marco has also completed further Physiotherapy training within musculoskeletal related topics such as neurodynamics, manual therapy, chronic pain relief and rehabilitation. Recently he finished his part-time Master’s abroad in Osteopathic Manual Therapy for Physiotherapists. Meanwhile, Marco has been continuing with his training in Spain, working towards becoming one of the few dual-qualified Physiotherapist – Osteopaths within the UK. Marco uses a well thought out combination of “hands-on” manual therapy and exercises depending on each person’s needs. “The key is to find the real cause of the problem and not just the symptoms if the diagnosis is right then the chances of a long term successful treatment will exponentially increase. My approach is to combine knowledge of anatomy, physiology, biomechanics and pathology from the combination of all systems of the body due to its multiple connections that you could not even imagine”. Marco can speak Spanish, Galician (similar to Portuguese), English and basic German. Likes: Spending time with family/friends, sports, nature, travelling and enjoying the sun! Dislikes: bad weather, traffic jams, pollution, small food portion and rude people! Favourite book: The Pillars of the Earth, Robinson Crusoe. Quote: “Enjoy the little things in life because they are really the big things in life”.